you know that feeling you get when you just happen upon something wonderful and magical and you get that little tingle in your brain that says – oh yes – this is something quite marvelous? So marvelous indeed, that it makes you want to pause for a minute and try to figure it all out, take it all in, get lost in for just a little bit in someone else’s imagination? Well, that’s exactly what happened when Ms. Jeannie stumbled upon the daily drawings of Patti Roberts-Pizzuto of Missouri Bend Musings. What a wonderful, daunting, ambitious project to take on – this idea of documenting your each and every day – in a drawing. Ms. Jeannie was so fascinated by this concept she just had to get in touch with Patti about her project. Ms. Jeannie: I love your idea of one a day paintings. How did you come upon the idea? Patti Roberts-Pizzuto: I like to have balance in my life, which is very difficult to achieve as we all know! One of the things that helps me is a daily ritual of some sort….my husband and I do yoga most mornings before breakfast and going off to work and that’s a daily ritual, but I was looking for some kind of studio ritual to keep me grounded. I did have a practice making 10 very quick meditation drawings each morning on cheap copy paper as a way to stay in touch with my inner language, so these daily drawings were an outgrowth of that. They began as something a little more “finished” than those morning pages, as I called them. I began with adhering a teabag to a sheet of Bristol and using that space for the daily drawing. After a couple of weeks, it dawned on me that these “dailies” could be the beginning of a new shop and MissouriBendMusings was born. MJ: Where do you draw inspiration from? PRP: I work very intuitively and have always said that I think through my hands. My inspiration never really comes directly from looking at something and wanting to capture it on paper, but rather from watching, listening, experiencing life and letting it filter through me….what comes out on the page is most often a reflection what I am thinking or feeling deep inside. I don’t expect anyone to be able to decode it and often I don’t have a real idea what the drawing is saying, but when I am most centered and have a balance that allows my interior life to open up, I know exactly what the work is saying. MJ: In your welcome shop banner, you say that your work is defined by the unfolding of time and the accumulation of memory (so nicely stated! ), what is your process of calling up these memories? PRP: As mentioned in the previous answer, it’s such an intuitive process that it is hard to describe. When I speak of the accumulation of memory, I am speaking more of collective memory….that is, the memory of our collective human history, which we all carry within us in some form or another, along with the accumulation of our own history and memory. They all melt together inside us, interwoven like a tapestry. It is very difficult to pull out specific memories in their entirety. I am very aware of time passing, and of the shortness of our days, but I try to keep in mind that we are, in the end, another essential link in the unfolding of history. I suppose at the bottom of it all, I make art so that I can leave a trace of my having lived and passed through this moment in time. MJ: The colors in your paintings are beautiful – do you dream in shades of red and grey and neutrals? PRP: I’m much more comfortable with neutrals. I think they are filled with subtleties that allow for more reflective gazing. Bright colors are a flash and for me, working with subtle, muted colors is very exciting….to see how one color plays against another….there is more nuance there for me, somehow. MJ: Explain your physical work space. PRP: As I sit here in the studio typing, I am looking around this big studio space and am very comfortable with all the color, with the fragments gathered from here and there tacked to the wall, surrounded by books and artwork and yet part of me longs for a totally stripped down space….one large room, painted white, with one simple table in the middle. My husband (a printmaker) and I built this house and the entire lower floor (which is a garden view basement and only ½ underground) is studio space. 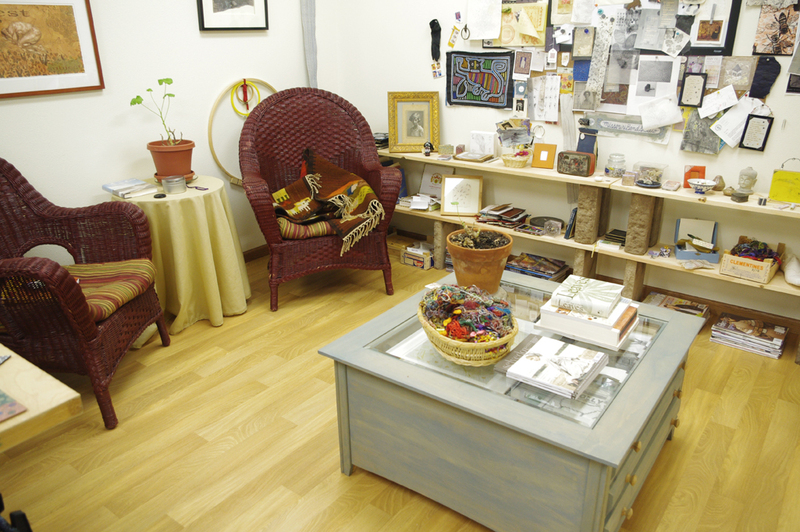 There is a large shared space and we each have separate 12’ x 24’ studios. MJ: You recently moved from Florida to South Dakota – that’s a big difference in geography:) What do you like about your new town? What do you miss about Florida? 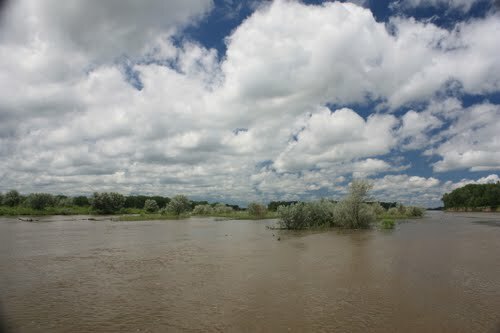 PRP: I love the landscape here in southeastern South Dakota. We live right on the Missouri River and are located nearly at the border with Iowa and directly across from Nebraska. It is a gently rolling farmland, full of amazing subtle color! People think that Florida is so full of color, but I’ve been amazed how much gorgeous color there is in the landscape here in all four seasons. People probably think of the winter as gray and dead, but the reds and yellows of the grasses and shrubs against the snow is really quite amazing, not to mention the variety of blues, browns, etc. We still have friends that we miss in Florida (seven years later), but as a place, we are much happier here. We also really appreciate the four seasons we have here, each one with it’s own unique pleasures, so we can look forward to new things happening all year long, knowing they are only a seasonal thing. It is very rural here, so we’re at least 45 minutes from any real city (our address of Burbank is just outside our real town of Vermillion which is only 10,000) and that is often a drawback….but not when you think that many, many people drive that long or more just to get to and from work each day! MJ: What book are you currently reading? 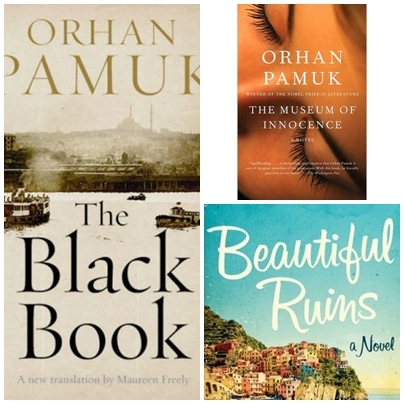 PRP: Orhan Pamuk (I recently finished the Museum of Innocence, one of my all time favorite books and am currently reading The Black Book, but finding very little time to read these days). Also reading Beautiful Ruins by Jess Walter. Reading is an essential activity for me….like food. I’m feeling out of sorts these days because I don’t have time to read. I have to have new ideas and language to feed on, otherwise the well runs dry. Reading is a slow activity and allows time for reflection, essential for the creative process. Our contemporary life doesn’t allow for much of it. Side Note: The Museum of Innocence is on Ms. Jeannie's bookshelf too (waiting to be read). Interestingly enough, Orhan Pamuk opened his own Museum of Innocence in Istanbul, based on the book,  which catalogues the everyday life of  the people of Turkey. A fascinating concept - book turned museum. This makes Ms. Jeannie wonder what other good books could become their own museums. Hmmm.... what do you think? 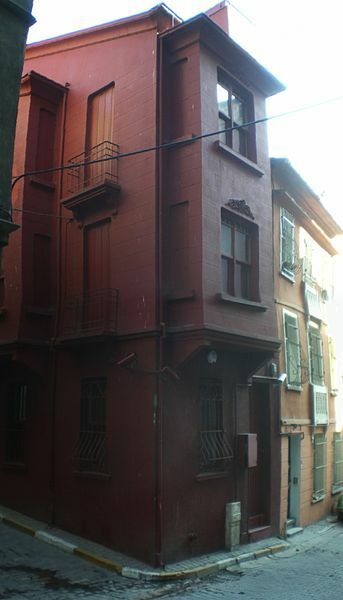 Orhan Pamuk’s Museum of Innocence in the Çukurcuma neighborhood of Istanbul. 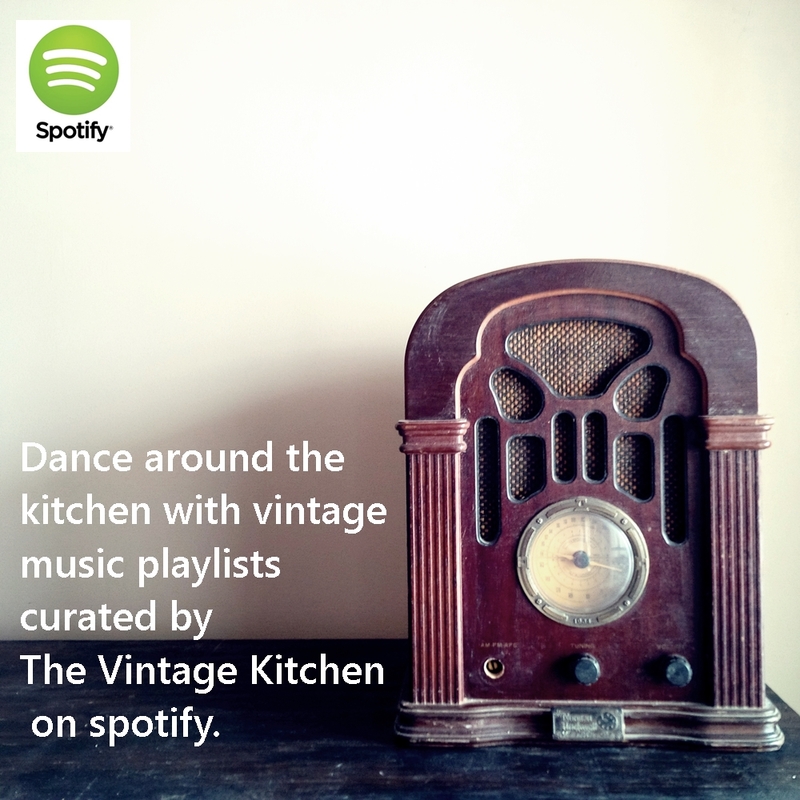 MJ: Music – wise, what are currently listening to? PRP: An eclectic mix of classical, folk and ethnic. Right now, here in the studio, Patti Griffin is on the CD player, which replaced the Norah Jones disc. Upstairs, we’ve got Monsters of Grace (Philip Glass) and the Bach Cello Suites loaded on the player. We’re so old fashioned, we still buy CDs! I’ve never been one to download music and put it on an ipod….I need the object itself. MJ: Do you collaborate on ideas with your husband? PRP: We have done collaborative projects together, a couple of times with visiting artists. We’ve been invited by Johntimothy’s colleagues at other universities to do a collaborative print project together and that’s worked out nicely. We both contribute to the drawing and the imagery, but he handles all the technical and print-related aspects. We also did a collaborative exhibition of a series of mixed media pieces on panel a few years ago. Generally though, we confer we each other from time-to-time on questions with our work and we definitely support one another through the ups and downs, but our work and creative processes are pretty distinct. MJ: Do you feel pressure to work under your one a day concept? What happens if you are stuck in a creative rut one day or if life interferes with your painting schedule? PRP: The daily project has nothing to do with being in a rut….it is a process of balancing, being in the moment and not ultimately about making art. Sometimes life does interfere and I don’t get up in time to get down here to the studio and it doesn’t happen until the next day….I just make two the next morning. It feels like cheating, but it’s also that pull of making something for the marketplace (my Etsy shop) that sometimes short-circuits the actual intent. MJ: Do you have an ultimate end date for your painting a day project? PRP: It’s very difficult to keep up with the project as a shop (all the photography, posting, etc.) so I’m not sure how long I can keep it up, now that I am working 30 hours a week. I wasn’t working when I started and it was much more doable. I want to keep it up at least a year, so will go til early January and then will rethink things. I may merge them with my first shop, MissouriBendStudio, but we’ll see how I feel by the end of the year. I’m sure I will continue some sort of daily practice, such as this, but they may not see the light of the day….or find their way to the marketplace. 9 months in to a 12 month project. Each square represents one month of drawings in the Missouri Bend Musings Daily Drawing project. The blank spots represent the months still to go. MJ: What do you hope to accomplish with your daily markings of time and place? PBP: I hope to have it be a daily reminder not to take anything for granted. It’s a way of creating the illusion of slowing down time and bringing myself back to a quiet place… in the moment, rather than living life according to all the things that must get done….which is the other 98% of my day. Can you explain a little bit about the subject matter or events surrounding each? PRP: Now that I’ve looked back at each of those pieces, I think mostly the common theme is the notion of writing, text, and the page. The August pieces are more like ledger pages, which was the point at which I was realizing that these drawings were like a counterpart to the Notes From the Ancestors series and could be seen as notes TO the ancestors. The ledger page is a kind of accounting and a way of taking stock….a metaphor for trying to find balance, so to speak. There is often a notion of the book page and an illusion to text in my work, which shows up because of my love of the book and the importance of writing and of language. I have spent many years of my work life (outside the studio) as a library cataloger and the intimacy and small scale of my work is a reflection of that. My work is meant to be seen as if looking at a book page….a one-on-one experience and often harkens back to the look and feel of the book page. The work I make does not hold up across the room, but hopefully will draw you in from across the distance to have an intimate experience with the subtlety and nuance of the marks and surface. Some of the works you mentioned are very spare and minimal….a reflection of my need to say what is essential and leave the rest out. It’s all about balance, finding it in the work and in life. MJ: Which is your most favorite painting so far? PRP: Although the early dailies on the teabags utilized more acrylic paint, I always think of my work as drawing rather than painting. For me, drawing is a more direct expression somehow. I know there are many others who wouldn’t agree, but each person has their own creative process and mine is based in drawing….the extension of my hand moving across the page. There is no favorite really. I try to remind myself that the goal is not to make “art”, but to make honest marks and not think so much about what is supposed to happen as I make the piece. Having said that, looking back after having made the pieces, there are some that I am much more satisfied with as pieces of “art” than others. I won’t list them here, but I’ll also say that some of the pieces that have sold surprise me as they are not my favorites….but that’s the beauty of it….each person will experience them differently! MJ: Do you ever feel like you haven’t gotten the day right on paper, as you see it in your head? Do you go through multiple draft paintings for the day or just one draft? 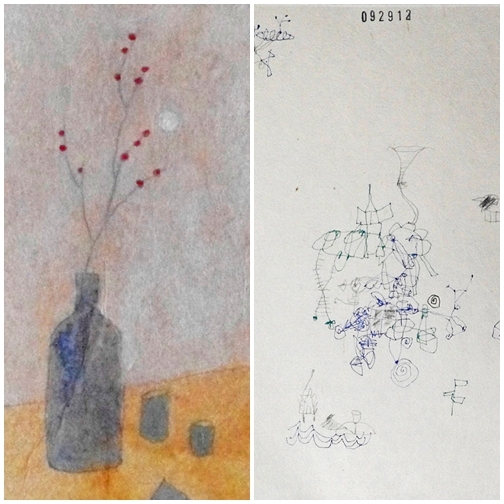 PRP: I now make these drawings in the morning….very early before we do yoga, which is also before breakfast. It’s the beginning of the day, rather than the end of it and I’m not trying to capture anything….the goal for me is not to think, but to let go and let my hand begin making marks, letting the drawing unfold as it will. It’s more a conversation rather than a one-sided goal-oriented process. I hope it doesn’t sound dismissive to say, but they are what they are….there are no real revisions. The drawings now are much more spare and I am in a place where I am having a conversation with history, with the collective ancestors, so to speak. I have another series of work, posted on my website (www.robertspizzuto.com) called Notes From The Ancestors….and these little daily drawings have become, for me, the other side of that, so they are, in a small way, Notes To The Ancestors. It’s a way of saying, “I am alive….this is what life is like here in the early days of the 21st century.” Again, it reminds me of my place in the continuum. MJ: Why did you choose to work with tea bags as your paper medium? PRP: Partly, I am a tea drinker, although I drink loose tea for the most part (and have to depend on others to keep up my teabag supply needs!) so have an affinity for all things tea. 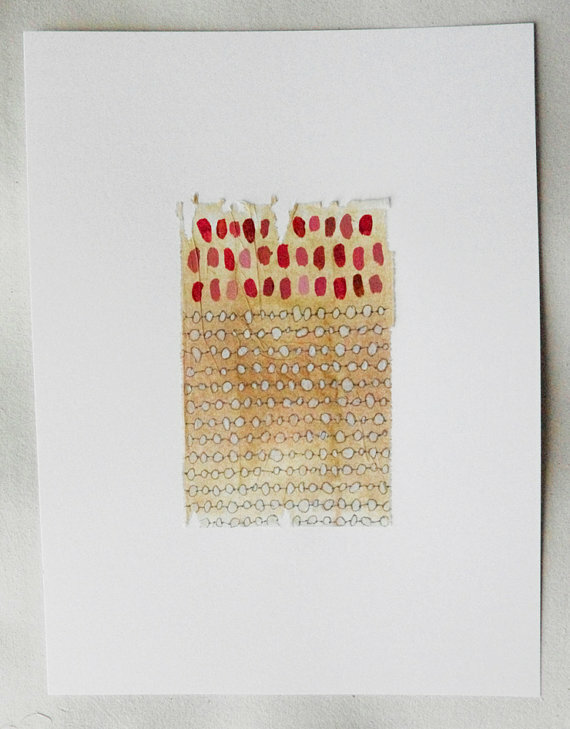 I love the warmth of the subtle tones and the surface….and especially placed against the white of the paper. 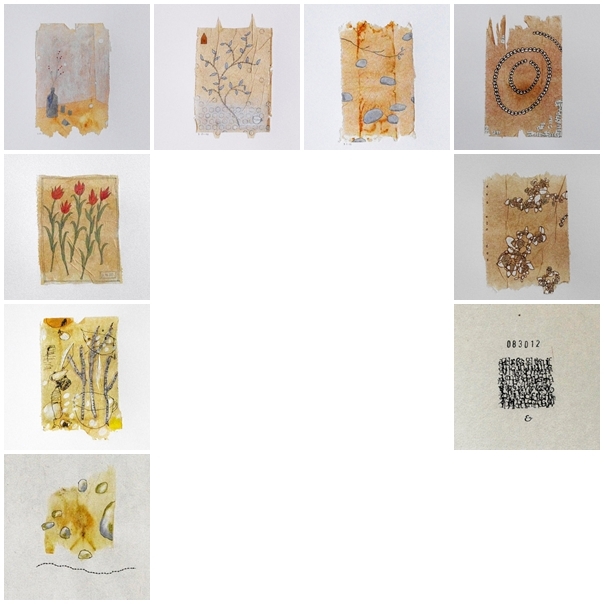 I moved away from the teabags for awhile, but am reintroducing them in this week’s drawings as I place just fragments of them on the Japanese paper. MJ: What artists inspire you? 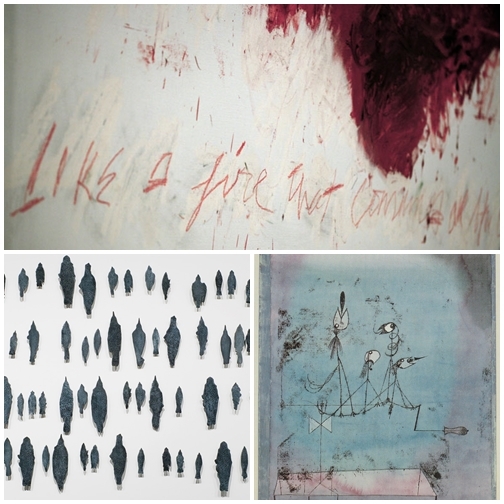 PRP: Kiki Smith, Paul Klee and Cy Twombly, to name some well known names. I’ve met so many amazing artists on Etsy and through the blog world that are just too numerous to name….they all inspire me. And the work of my husband, Johntimothy, is absolutely an inspiration to me….even though we work much differently. MJ: If you could sit down and lunch with any famous person living or dead who would you choose and why? PRP: I ask a very similar question to the artists I interview on my blog! I love the idea of this question, but now that I am put in the place to have to provide an answer, I am dumbfounded! I think I would have to have a small lunch gathering with Bill Clinton (I’m reading an article in Time magazine written by him….what a hopeful outlook! 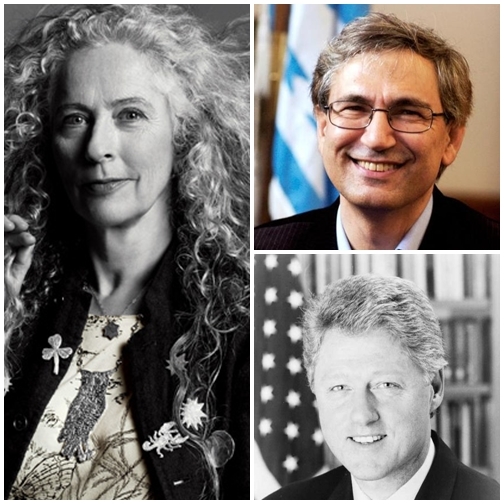 ), Orhan Pamuk (contemporary Turkish author and Nobel Prize winner), and let’s say Kiki Smith, one of my favorite contemporary artists. I think we could make lots of connections between global thinking, the essential nature of collective memory and the role of the arts in the possibilities for a better future. There are so many possibilities, it is difficult to choose! Lunch with Patti would include Kiki, Orhan and Bill. That’s some interesting conversation for sure! MJ: I’m noticing that your more recent paintings are more abstract then previous paintings from early in the year. Do you see a transition in your thoughts as you progress? PRP: There is always a transition….life evolves and unfolds in surprising ways and the works I make are always a reflection of my current life. Yes, the daily drawings change and shift over time. I often write about this in my blog posts at www.missouribendstudio.blogspot.com. I think it is important as an artist not to tie yourself to the marketplace or only to make what you think people will want to buy or expect you to make….otherwise you are making production work….which is fine if that’s what you want to do. But, for me, remaining true to myself as an artist means that the work has to remain honest and know that it must evolve as it wants to over time. On the left: A drawing from January 2012. On the right: on Drawing from September 2012. MJ: Will you sell batch prints of your work or will they remain strictly one of a kind originals? PRP: I will never turn them into “prints” for many reasons. Not to disparage other artists, but I have very strong feelings about this. I am married to a printmaker and a printmaker is someone who makes prints, which are each hand-pulled unique works of art from a hand made matrix (carved, etched, etc.). Many artists will make reproductions of their work, which in today’s marketplace are called prints. But, they are really just a picture of the original work. I believe in the handmade work of art, each of which represents a unique moment of time and the hand of the artist. So, the short answer is that my work will always be one-of-a-kind. MJ: When you sell one of your dailies – do you feel a twinge of sadness in seeing them go, like a day now unaccounted for in your collection? PRP: Sometimes, the very slightest twinge, but mostly I am happy to know that there is someone out there who connects with the drawing enough to want to live with it. I’m honored by that and all too happy to know that my efforts communicate to others in some way. 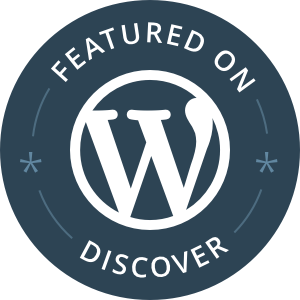 I’ve found the connections I’ve made in the online world through my Etsy shops and my blog especially, have been absolutely amazing. While my sales are not huge, I have sent work to many locations across the globe and am grateful to meet all the like-minded souls who let me know the work has meaning for them. Ms. Jeannie hopes this interview has given you time to pause and think about your own life. If you could record your daily life in some way – how would you do it? 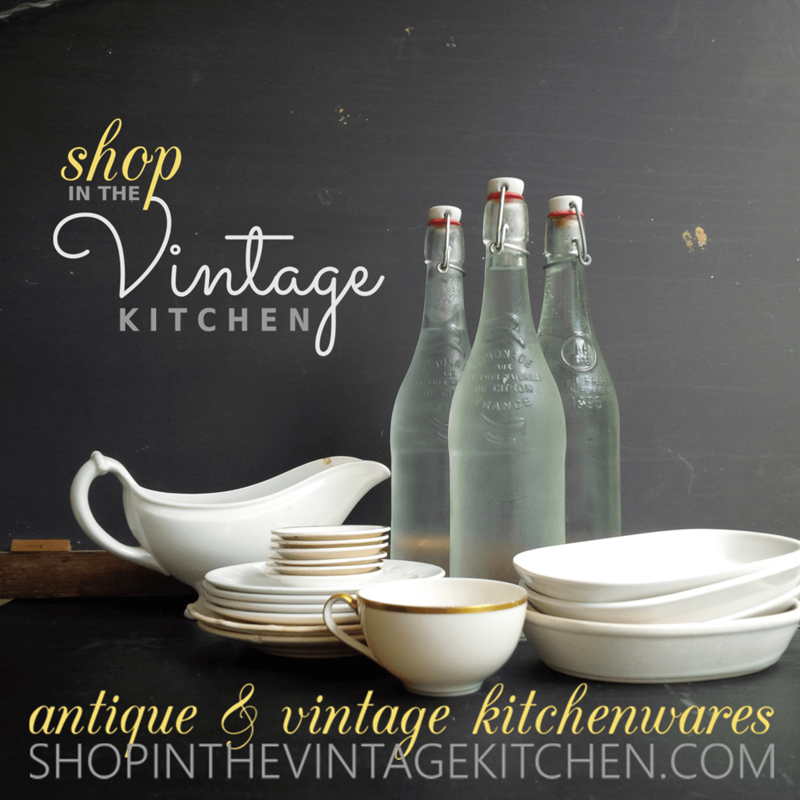 By the way, Patti’s having an Autumn Sale in her shop with 15% off! Use coupon code AUTUMNSALE upon checkout to receive the discount. Previous Clever New Love: Better World Books! A beautiful feature! I have been following Missouri Bend Studio for quite some time and her work is so deep and meaningful. It’s been a pleasure reading your article.